Today is the first day of school. This is the week where all the jobs I do are officially in full swing and operating all at the same time. People? I am busy. And to help me with this out of control busyness that is my world, I have recruited some of my most favorite bloggers in the whole wide world to come in and babysit Sluiter Nation twice a week this month. First up is my great friend, Kimberly. I don’t even know how to describe Kim to you except that she is the funniest Canadian ever (I know, I know…there are LOTS of funny Canadians…she still wins)! She also has some sweet gold pants and loves everything Chuck Norris. And? She is a PPD/A survivor too! 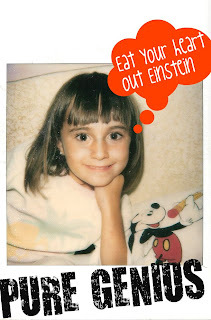 She makes me laugh every single day on her blog, All Work and No Play Make Momma Go Something Something... She has written hilarious and extremely poignant posts about her life as a PPD Momma and as the Momma of a sweet little boy. She is also a wonderful friend. You can follower her on twitter, but before you do that, please read this hilarious post about how she? 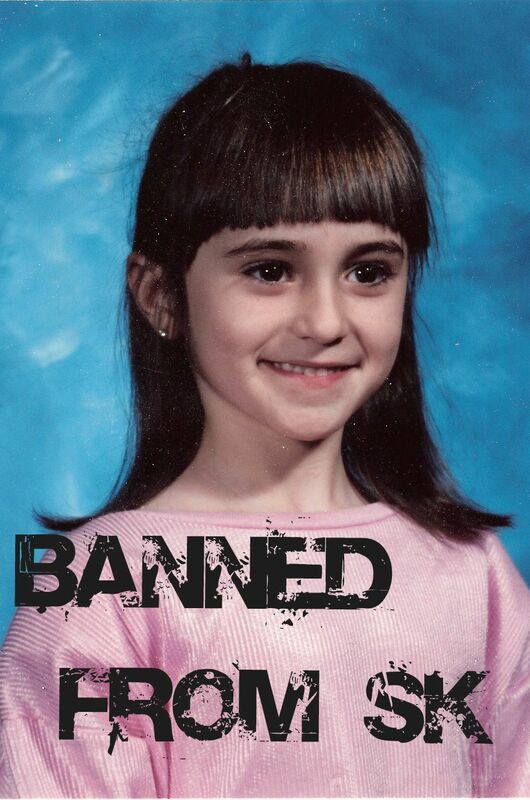 Was a total trendsetter way back in kindergarten. 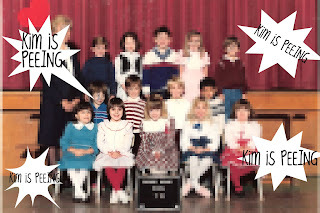 Katie had asked if I could share one of my favourite childhood memories of school and the first one that came to mind was the day I, the 5 year old kindergarten Kimberly, became a trend setter. 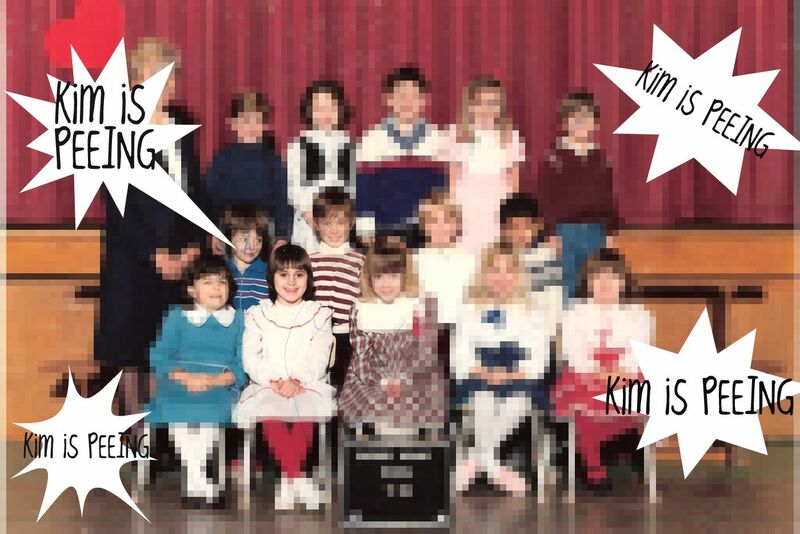 The first few weeks of kindergarten were a bit of a culture shock for me. I went from being a very boisterous outgoing star of my little world to being one terribly shy 5 year old. Like so terribly shy that I was too afraid to ask if I could use the potty. 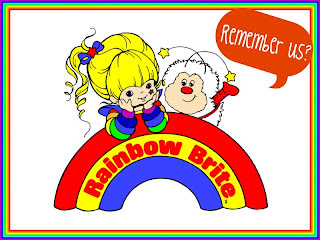 There were many days that I left school walking in tightly calculated steps praying that my bladder wouldn’t explode down my leg and ruin my Rainbow Brite running shoes and dear God. Save. the Rainbow Brite shoes. They were awesome. Every morning, we started our routine with singing the national anthem. On this particular morning, my tiny 5 year old will power to contain almost torturous levels of urine dissipated as I stood up. Immediately, I knew that I was in serious trouble. I contemplated raising my hand and asking to use the potty but there was no time for that. My bladder was ready to bust at the seams and I couldn’t wait long enough for the teacher to notice my desperate waving hand. In a panic, I came up with a plan…if I just peed a little bit, like just enough to ease the pain, I could hold off using the bathroom until the big hand was touching the 8 and the little hand was touching the 12…group potty break time. Chanted. In. Perfect. Unison. 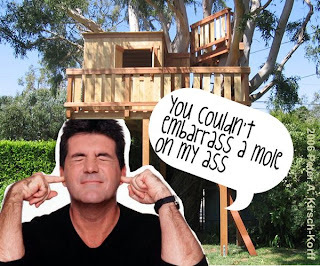 It was like they knew that this was going to happen all along so they had strategically rehearsed it in someones tree house with the aide of a real singing coach to help them precisely master the embarrassment level. The timing, the pitch, everything was that perfect. 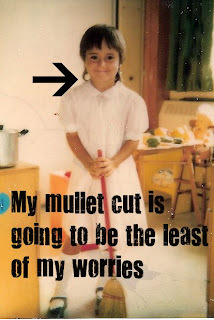 What transpired next was a whirlwind of finger pointing, slipping and sloshing, screaming, and tears, lots and lots of tears while the teacher tried her best to drag me to the safety of the bathroom. By then, it was too late. My tiny 5 year old bladder was already emptied onto the kindergarten floor. 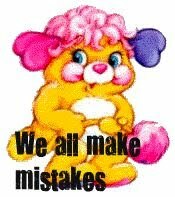 I was sent home that day in soggy pants and my dignity jammed into my Popples backpack. I looked over and sure enough, not only was he peeing, but so was Sarah T and Julie and Darcy. Before I knew it almost all the kids had unloaded their bladders on the classroom floor while our poor dear teacher was yelling in hysterics begging us all to stop and go to the bathroom. That day my friends, is when I, Kimberly Pee Pee Pants went down in infamy as a trend setter. Dear Sacred Heart Kindergarten Teachers, You are welcome. Thanks again Katie for giving me this wonderful opportunity. I had lots of fun rekindling old school memories! I wish you much luck starting this school year!! Hilarious! I, too, remember the day that I peed in my pink corduroy overalls in Kindergarten like it was yesterday, instead of, well…you know, like 29 years ago. 🙂 Thanks for starting my day off with a chuckle! I must have forgot to attach the sock photo 🙁 my bad! I am so excited! Thanks for this opportunity Katie!!! you are hilarious as always! the trauma we go through in kindergarten! I bet you still can't listen to Oh Canada without having to go. "Peeing your pants is the coolest!" That is obscenely humorous! Thank you for sharing. A goodhearted pee pants story is always good in my book. I peed my pants in school, too. But I was in middle school. And I was working the school store. It was my turn to close up. And I had a moral quandary. Go to the bathroom and leave the money box unattended? Take the money box with me and look like an idiot? Make a break for the front office to turn in the money box and then venture up the 8th grade hall to the nearest restroom? By the time I decided on a course of action, it was too late to do anything and pee was streaming down my leg. ::Sigh:: I'm still thankful I was alone in that room.